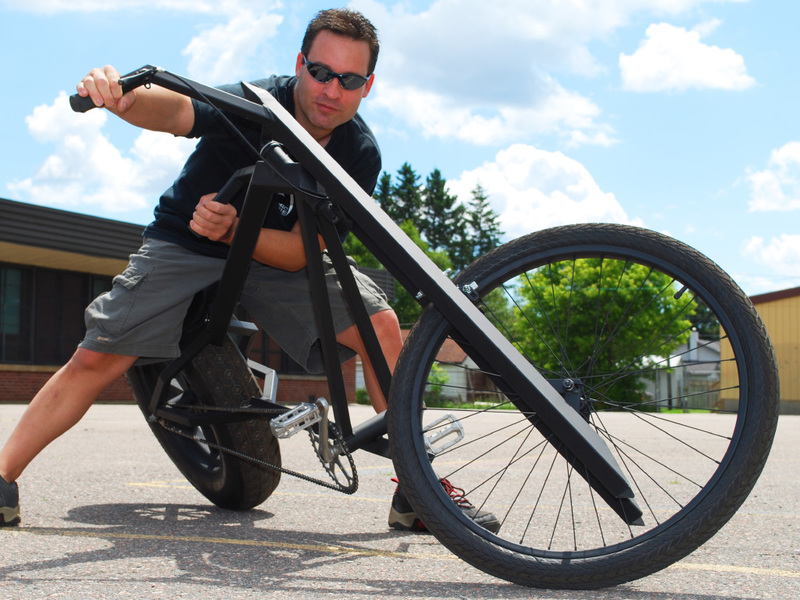 Build Your Own Stealth Bomber Style Chopper. This radical DIY chopper is styled after the edgy look of the radar evading stealth bomber, having no curved tubes and an ominous flat black look. This plan can be fully customized to suit your own creative ideas as well as the parts you already have on hand. Car Wheel Choppers Are Kings of The Road. The entire Vigilante chopper frame is made out of thin walled square tubing, even the spokes that have been installed in the rear car rim. 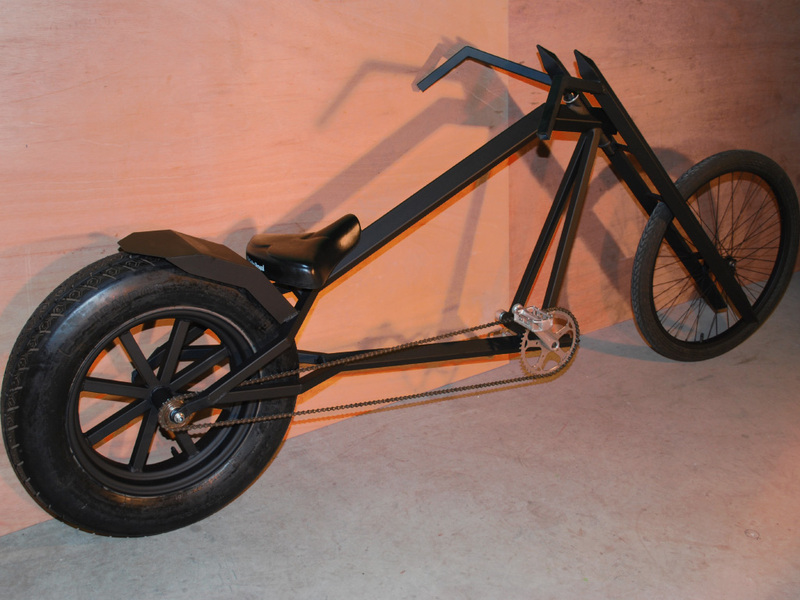 You can build this unique chopper frame out of just about any kind of tubing by following our step-by-step chopper plans, so you can create a very unique ride based on the materials you have on hand. Only common bicycle parts are used, and no experience necessary to build! Use Any Size Car Wheel. 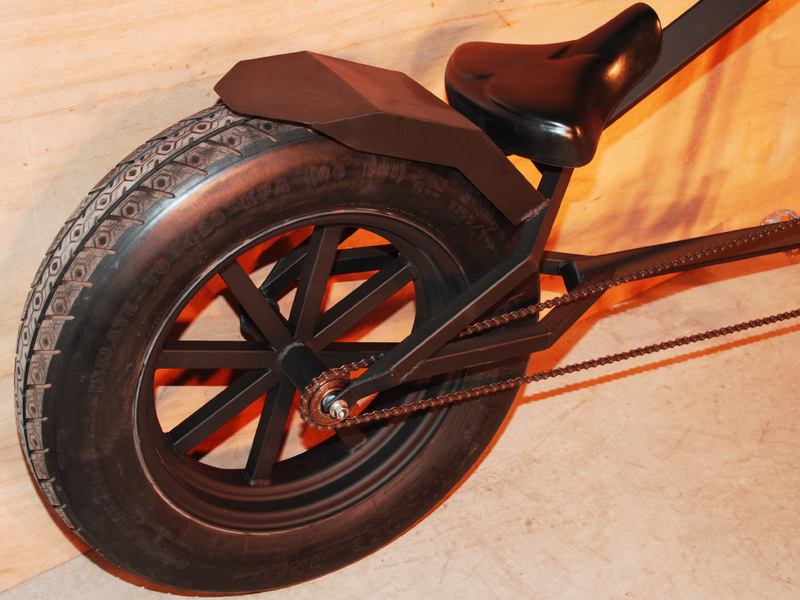 The Vigilante cycle chopper plan shows you how to convert a steel car rim for use on a bicycle by creating a custom hub made from standard bicycle components. 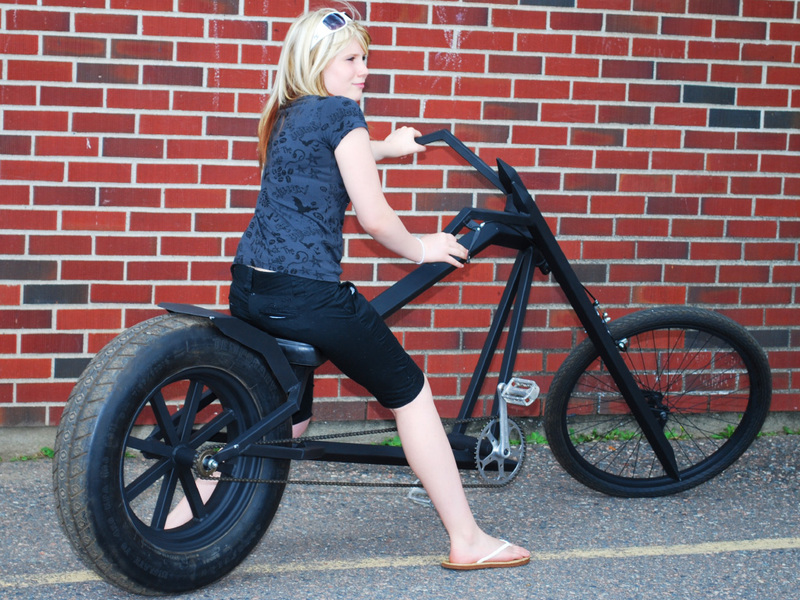 You can modify any size or shape of car wheel to create a truly radical chopper of your own design. Every part on the Vigilante chopper is made from either square steel tubing or standard bicycle components, so you can carve out your own ultra stylish DIY chopper using materials you have on hand or acquire. The unique style of this frame comes from using large thin walled steel tubing, which is lightweight and easy to weld. All of the frame tubing is turned 45 degrees as well, making it look completely different than any other chopper frame. Feel free to experiment. Rides Like a Regular Bicycle. The Vigilante chopper rides well and is easy to steer, making it a decent street cruiser or bike trial rider. The strong steel frame has plenty of room for the addition of a small gas engine or a battery pack to power a front hub motor, so you can go motorized and cruise around with no effort at all. Gear range is easy to change as well so you can tailor your chopper to the terrain. Go fast with higher gearing, climb hills with low gearing, or even add a gear shifter. There are a lot of unique and tricky parts on this DIY chopper, but all of them are easy to make using basic tools and old bike parts. The extra wide crankset and car wheel hub are all made from common bike parts, hacked with an angle grinder and then welded together. You Can Build This With No Previous Experience. Atomic Zombie chopper plans include many pages of detailed text and high resolution photos so no step is left out and anyone with the most basic tools and skills will be able to follow along. Never built a bike? No problem, this DIY chopper plan will show you how. The forks are also made from common steel tubing, and you are free to make them as long or short as your style demands. You could even use round tubing if you have some available. 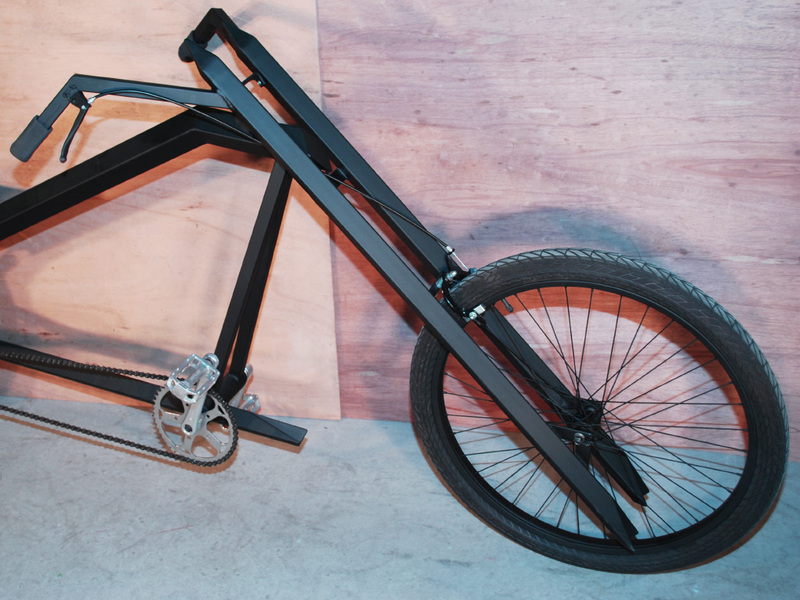 Customize every part of the bike to make something completely radical. Create Custom Spokes For Your Rear Wheel. This DIY car wheel chopper plan shows you how to gut any old steel car rim and convert it for bicycle use. You can create just about any style of spokes you like, from this simple square tube mag style to something as elaborate as a cutout pattern of your own design. The inside hub is made from steel tube and a hacked bicycle hub, so it is easy to attach whatever type of custom spoking you may want to create. 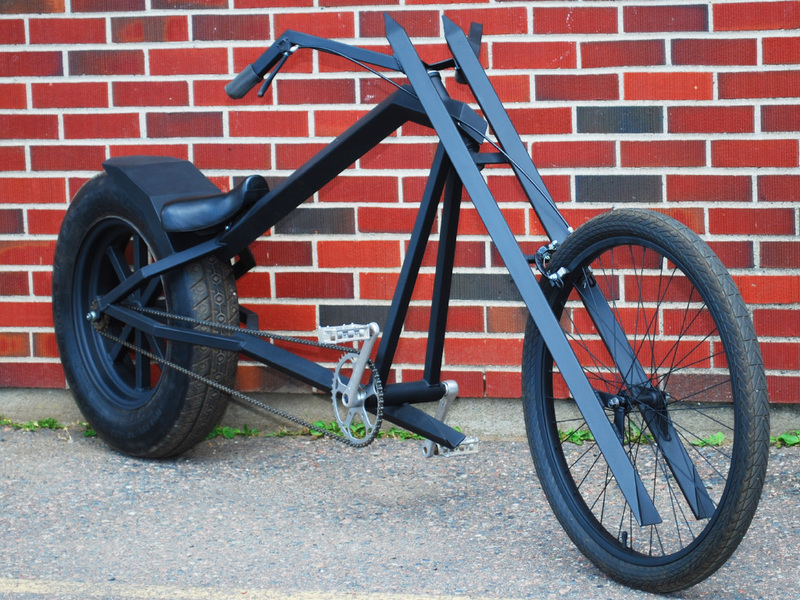 We are all about recycle and reuse, so the Vigilante Chopper Plan encourages using the parts you have on hand, as well as salvaging bicycle components from old unused frames when you have them. Turn your junk pile into a crazy chopper with massive attitude. Detail Your Chopper To Suit Your Unique Style. Once your DIY chopper is completed, add some bling with a new paint job and some attention to the details. It's the details that make your work stand out. 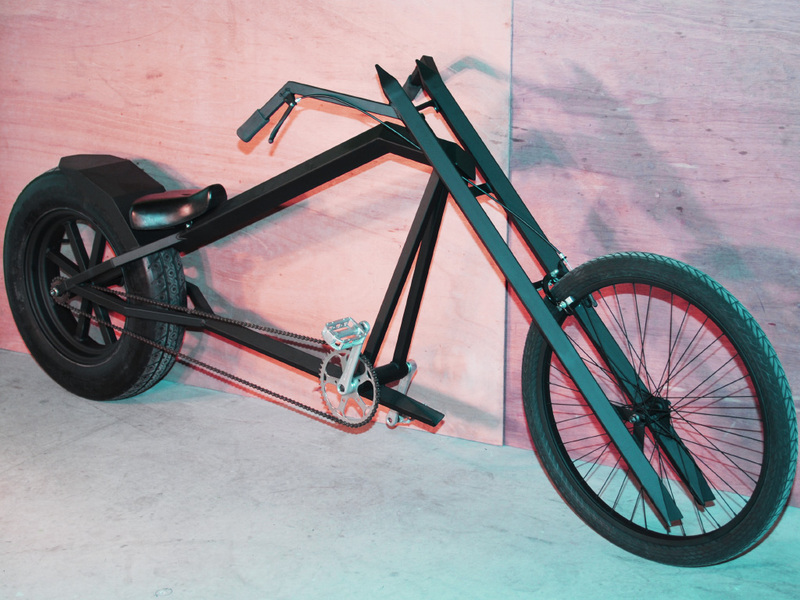 The flat black stealth style shown in this DIY Chopper Plan is just one example of style, and you are free to create your own style theme to push your design over the edge. Creating your own chopper theme is the best part of the build, and where you can really let your imagination wander to the far side. Hack, paint, ride! Fenders can be made from bent and welded sheet metal as shown in the plans, or from composite materials like fiberglass. All of the frame angles are easy to modify to suite your own style as well, such as head tube angle, frame height, and fork length. Creativity Plus Attitude Equals Chopper! 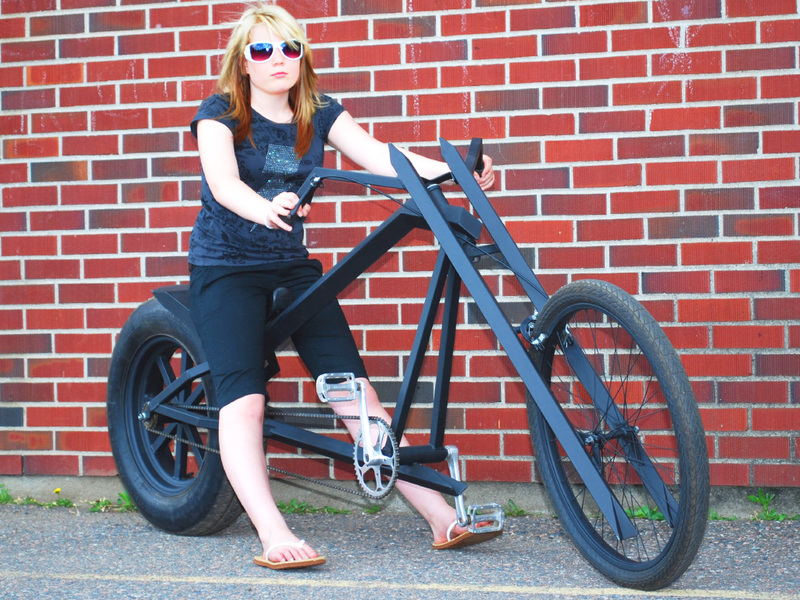 Choppers are the hot-rods of the bicycle world, and certainly the most fun type of bike to create. You can really let your creativity run wild. Since weight and performance are low on the features list, you can utilize just about anything that can be cut and welded when making your chopper frame. Anything made of metal is fair game for hacking into your chopper design, so have a good dig through your junk pile and turn that scrap metal into something amazing! Custom is all about doing it yourself. No mass produced department store chopper will ever have the kind of attitude that a home built chopper will have - not even close! Spark up your welder and crank out your own radical custom chop using our easy-to-follow DIY chopper plans.